A blessed Wednesday to you dears! Take care alwaysDon’t undo the... – Juka's Organic Co.
Don’t undo the progress you made last week; make good choices every time. The only person you need to be better than is the person you were yesterday. Get the challenge of staying healthy to yourself before making another unhealthy choice. As you make your favorite recipes into healthier versions, remember that it’s progress, not perfection that counts. Even making only one change to a recipe is a step in the right direction. Keep in mind, when your body is hungry; it craves nutrients and not calories. To make it all easy for you, we at Juka’s Organic willing to include red palm oil gourmet sauce in your daily diet plan. Enjoy this delicious red palm oil cooked sauce by preparing the mouthwatering dishes you love the most. You can use this amazing sauce to any cooked grains, fish, meat, tofu, vegetables, yams or even beans in just under five minutes. 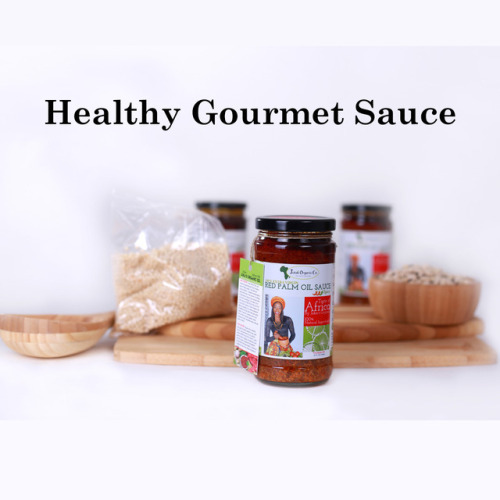 The healthy red palm oil gourmet sauce is filled with all natural and basic ingredients with zero preservatives, MSG and GMO free. It is all vegan and a jar from us ensures you get all the goodness of red palm oil that has the highest level of antioxidant compared to any cooking oil.